a Company Commander in the German Army, who lost his life trying to save a wounded American Soldier. of bravery by a German Soldier, who at the time of the act, was an enemy at war with the United States. German - Belgian border called the Hürtgen Forest. 12,000 Germans were killed. "Whoever survived Hürtgenwald must have had a guardian angel on each of his shoulders, "
wrote Ernest Hemmingway, who covered the battle for Collier's magazine. 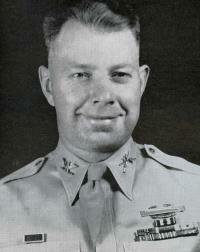 Colonel John F. Ruggles in his offical portrait as Commanding Officer of the 22nd Infantry Regiment. As a retired Major General, Ruggles was the moving force behind the monument to LT Lengfeld. this one doesn't honor our own soldiers. This one honors an unheralded act of humanity by a 23 year old German Infantry Lieutenant. Ruggles wasn't interested in media attention last year, and the monuments dedication received no news coverage in this country. But a friend recently convinced him that others would like to hear the story, so last week he talked about it. the cries no longer. He formed a rescue squad, complete with Red Cross vests and flags, and led his men toward the wounded American. He never made it. Approaching the soldier, he stepped on a land mine, and the exploding metal fragments tore deeply into his body. 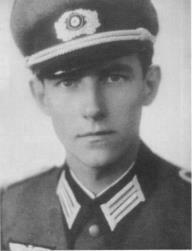 on the war, is based on the eyewitness account of Hubert Gees, who served as Lengfeld's communications runner. of the Hürtgen Forest. He was an exemplary company commander, who never asked us to do more than he himself was ready to give. He possessed the complete confidence of his soldiers. 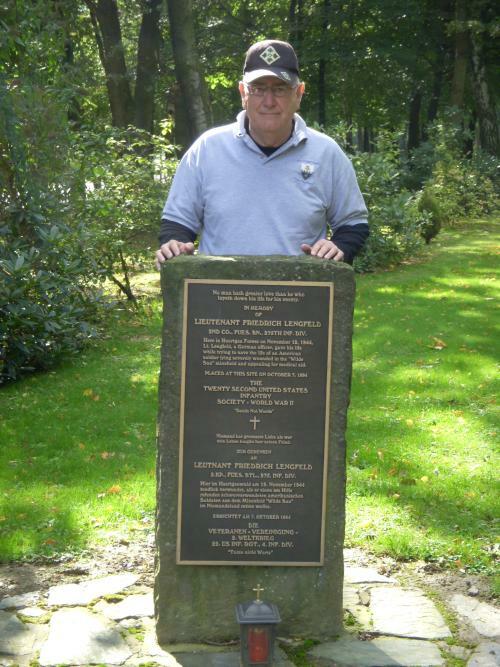 in a German military cemetery. To the young Lieutenant, the voice crying out that day did not come from an enemy. Nor from an American, nor a stranger. that glorious impulse for life is now honored. 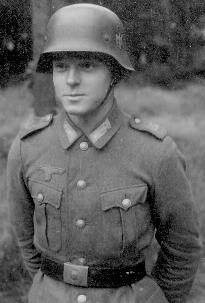 Hubert Gees from Salzkotten/Eastern Westphalia, Germany, was a soldier in the 2nd Company of the Füsiliers Battalion. On October 7 1944 his Company Commander was wounded. A replacement Commander lasted only three days. a lot of inner strength. He was an exemplary company leader and he claimed never more from us as he was willing to give by himself. on trees with a flogging bang and we got the impression that the enemy broke into our positions he never said "Go and check"
just to lose it again in the forenoon, our company suffered a severe loss. In the early forenoon an obviously heavy wounded G.I. Lt. Lengfeld ordered our corpsmen to put together a rescue squad. This must have been around 10:30 am. whose positions were relatively easy to locate. Just when the Lieutenant wanted to change the side of the road approaching the G.I. he was taken down by an anti-personal mine. In a great hurry he was taken back to our command post to be given First Aid. Two holes in his back with the size of a coin suggested severe internal injuries. Lt. Lengfeld moaned in great pain. 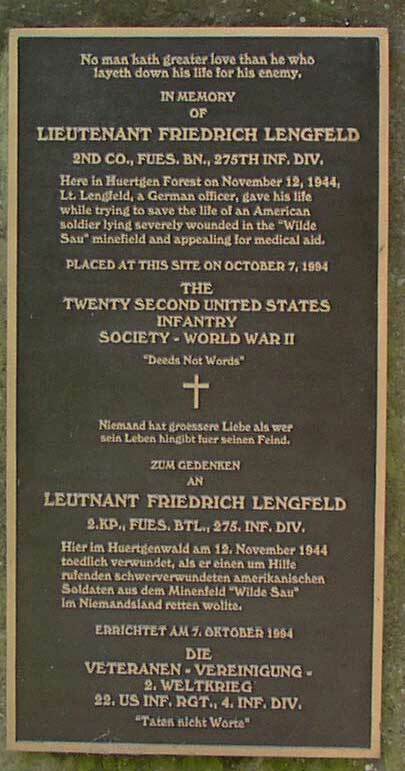 from his severe injuries on the main casualty station at Froitzheim"
where LT Lengfeld attempted to save the wounded American. 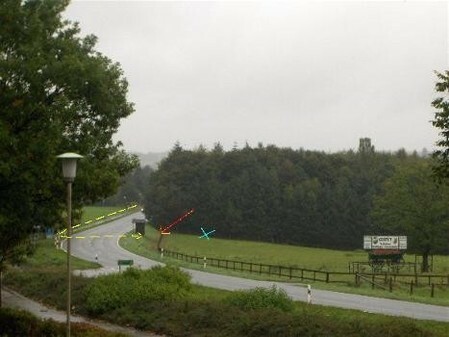 the blue "x" is at the position of the wounded American soldier. The photographer was standing in front of the memorial looking south. heavy fighting raged, accompanied by artillery duels and tank battles. The U.S. Army Air Corps joined in the ground fighting. Here by Huertgen counterattacks had already commenced on 3 November against the curved front of the 109th Infantry. On 7/8 November the lO9ths sector of the front was taken over by the 12th Infantry Regiment of the 4th U.S. Infantry Division. and on 13/14 November for some 10 days was again in our hands. softened land beset with puddles. The fighting infantrymen wading , lying and fighting in mud are close to complete exhaustion. staff officers there, and very few men. But men who cannot even be brought forward at the point of a pistol, are there. to rescue the severely wounded soldier. When the heart rending cries for help continued for hours Lt. Lengfeld ordered our medical aid men to form a rescue troop. the street directly over to where the severely wounded American was lying, an exploding antipersonnel mine threw him to the ground. in Froitzheim. His last resting place is Grave No. 38 in Diiren-Rälsdorf. American. He may have saved himself by reaching the American lines before this part of the forest fell into German hands on 13/14 November. The forward push of the U.S. 8th Infantry Division on 20./21 November paved the way for the downfall of Huertgen. our troops out of the forest on both sides of the main road and they succeeded in taking the village of Huertgen on 28 November 1944. I was taken prisoner by the Americans along with three of my comrades in the cellar of the Foresters House near the church. Fuesilie Battalion, to go amongst other prisoners into the valley as prisoners of war. We had the good luck to survive. 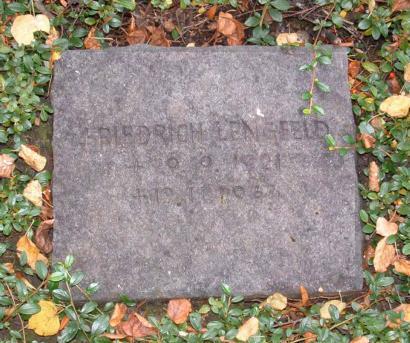 Though the monument to Friedrich Lengfeld is located at the cemetery at Hurtgen, LT Lengfeld is not buried there. He is buried in the small cemetery in Düren-Rölsdorf, about 10 miles away. His grave is number 38 of 69 graves in that cemetery. His marker is unadorned, and consists of only his name, date of birth and date of death.